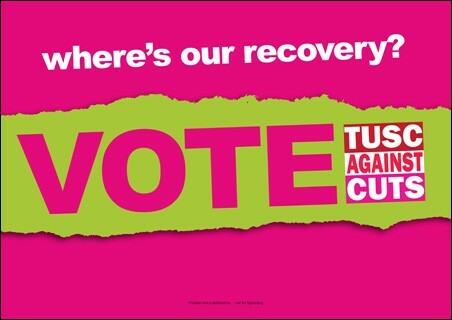 Swansea Trade Unionist and Socialist Coalition (TUSC): Where's our recovery? The week that sees the official announcement of the election has also seen the announcement of another food bank opening in a working class community in Swansea. Conservative and Lib-Dem politicians keep telling us that things are improving but that's not the experience of most of us. If just heard on the radio that disposable income went up 1.9% per household in the last year. Not in my house it didn't nor in the household of anybody I know! TUSC asks "where's our recovery?". The profits of the bosses and the bonuses of the bankers may have recovered and passes the levels they were at before the economic crash that their greed was trigger for. But for workers there's still too much month at the end of the money and increasing numbers of homes in working class communities struggle to even put food on the table. That's why TUSC representatives are socialists; we want to use the vast resources in society for the benefit of the masses not the profits of the minority at the top.